I am looking at rehabbing a older apartment complex. Do you have anytips for adding solar power into the financing, and selling the excess power generated to the utility companies? Thanks for your question. It is going to depend on quite a bit of variables: 1) Are you hoping to generate solar power to cover the individual tenant’s electricity use? Or the building owner’s electric bill? 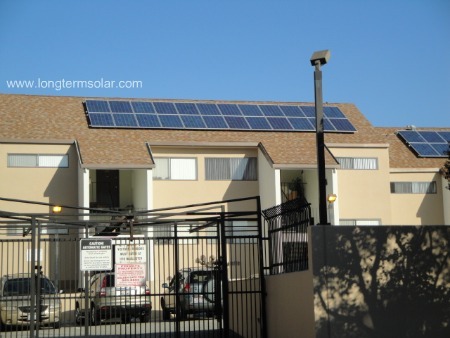 As for adding solar into the financing, that is something that most building owners end up doing. Taking out a loan on the solar, and combining that with the rebates and tax credits that you may be eligible for is a great idea, and usually necessary for the project to make financial sense. You can depreciate the solar system as well. Selling the excess power back to the utility company is not that big of a deal, and is usually handled automatically with Grid-Tied-PV Systems. My suggestion would be to contact a local solar installer who has experience with larger commercial solar projects, and then ask for references to follow up with before spending any money. Also, you want to understand in writing EXACTLY what you will be eligible for in terms of rebates/tax credits etc… BEFORE you spend any money on solar. that’s super importante! I am looking at generating solar power to cover the individual tenant’s electricity use. I’ve been trying to figure out how to bill the tenants, Would have loved something automated. Any idea how to go about this?? Do the tenants have separate electric meters? Or are they all connected to the same one? Let me know the answer to that and I’ll have a much better idea on how to answer your question. I own and manage several HUD subsidized Seccion 8 buildings in Puerto Rico, all tax credit (LIHTC). At this moment, I am getting ready to refinance and remodel a 127 apt, 13 story. Each apt has an individual meter and we pay for the consumption in the common areas, hallways, administration offices, onsite maintenance crew shop, elevators etc. I am considering installing solar panels in the roof, to power at the very least, the common areas, thus reducing my operating costs. I need information on, similar projects, Power Purchase Agreements, renewable energy tax credits etc. if I may add, the corporations that own these buildings were created in the US in order to obtain federal Low Income Tax Credits. Any information that can help me decide whether this is financially sound investment will be appreciated. I need direction. The first question I would have is about your current electricity prices for the common area. If you look at your most recent bill, what was the total cost of the electricity, and what was the total amount of kilo watt hours(kwh) used for that amount of electricity? Once I had a better understanding of that figure, it will be much easier to answer your overall question. thx! I have a question. I live in an apartment bldg in CA. My apartment is on ground level and my patio catches the morning sun and has no obstructions. Could I place something small on my patio to catch the solar energy and use it for my own electricity like some RV’s do? Great to hear form you. That is a possibility, but it would be best to have solar panels which can catch the sun the entire day. 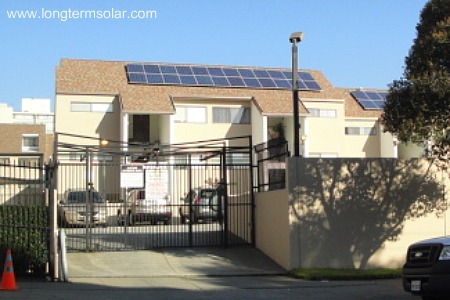 Maybe you could talk with whomever manages the apartment building, and find out if there is a possibility you could mount a small solar system on the roof and attach the system to your metered electricity meter. That would be my best suggestion, and the one which would probably make the most financial sense if you are also the owner of the apartment.